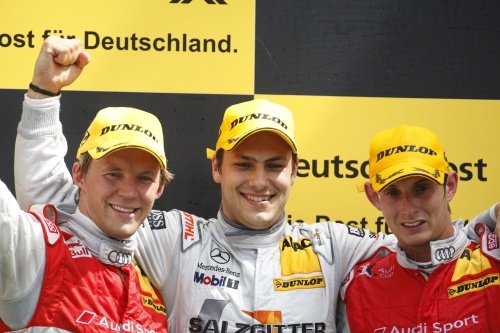 BRDC Full Member Gary Paffett has taken his second win of the DTM season at Zandvoort and in the process moved into the championship lead. The former champion moved ahead of pole sitter and BRDC Full Member Oliver Jarvis on lap 14 with Oliver holding on to claim the final podium spot at the end of the race. BRDC Full Member Paul di Resta gained a place in the results following the disqualification of fourth placed Alexandre Premat which moved him up to sixth. BRDC Honorary Member Tom Kristensen and BRDC Full Member Jamie Green then moved up two places as eighth placed Timo Scheider was also taken out of the results, which moved Tom to eighth and Jamie to ninth. BRDC Full Member Rob Huff recorded another podium at the World Touring Car Championship round at Brands Hatch yesterday. The RML Chevrolet driver had to work hard to keep ahead of fellow BRDC Full Member Andy Priaulx with the pair eventually finishing in second and third place. BRDC Full Member James Thompson, in his second weekend of the season in a Lada Priora, was 18th. In race two Andy Priaulx was in a battle with SEAT’s Rickard Rydell when he lost a place to Gabriele Tarquini. The former double champion eventually finished the race in fifth place just ahead of Chevrolet driver Rob Huff. James Thompson finished race two in 22nd place. Marino Franchitti finally achieved the podium he’s been looking for in the LMP2 ALMS having taken the class win at Lime Rock on Saturday. Marino began the race and after soon taking up the class lead, held on until handing over to co-driver Butch Leitzinger and he was then able to hold on to take the LMP2 victory. Fellow BRDC Full Member David Brabham also had his own successes when he took second both overall and in the LMP1 class in the Acura ARX while BRDC Full Member Johnny Mowlem was just a place behind him in the Ginetta-Zytek. BRDC Full Member Richard Westbrook finished fifth in the GT2 class and 11th overall. BRDC Full Member Andy Wallace has been in action in the Grand AM race at the Barber Motorsports in Birmingham, Alabama over the weekend where he finished 11th along with co-driver Rob Finlay in the Chevrolet Crawford. BRDC Superstar and Full Member Oliver Turvey’s impressive run of form continued at Le Mans in the first race of the Formula Renault 3.5 with a third successive podium, having taken a double last time out at Silverstone. BRDC full Member Fairuz Fauzy was seventh while James Walker was an early retiree. In the second race Fairuz was the highest placed BRDC finisher in fourth place while James Walker was ninth just ahead of Oliver. BRDC Full Member Sam Bird recorded a second place in race two of the Formula 3 Euro Series at Zandvoort yesterday. In the first race of the weekend on Saturday, Sam was eighth while BRDC Full Member and Superstar Alexander Sims was 13th. Alexander finished the second race in ninth. BRDC Full Member Alex Mortimer won the Avon Tyres British GT race at Donington Park yesterday in a Ford GT. And there was a further BRDC podium as Full Member Aaron Scott took third place with co-driver Craig Wilkins. Phil Keen and Martin Short, both BRDC Full Members, finished in eighth and tenth respectively.